Dates of birth and death unknown. His first stage name was Nakamura Kasen. He performed in the 1st lunar month of 1712 in Ôsaka. He took the name of Nakamura Kichisaburô I  around 1715. He played in Kyôto at Ebisuya Kichirôbê's theater at the 11th lunar month of 1718 the role of the menoto Kinugasa in Adachi Saburôzaemon's kaomise drama "Shiga no Miyako Kogane no Hanazono". 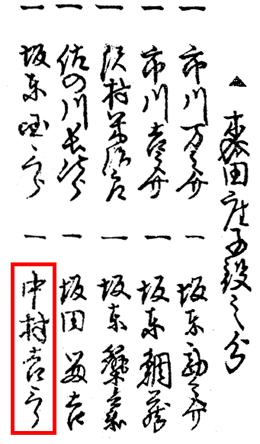 His rank in the 1719 Kyôto hyôbanki, wakaonnagata section, was (shiro)jô. No record afterwards. This minor wakaonnagata actor was also called Yamatoya Genji. Dates of birth and death unknown. It is a difficult, almost impossible, task to unravel the shroud of mystery surrounding the life and career of Nakamura Kichisaburô II . 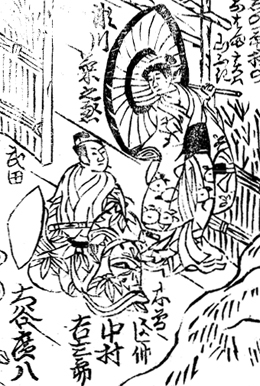 In Haiyûdô Muyû's book "Yakusha Yoyo no Tsugiki", it was reported that he was a disciple of Arashi San'emon II, who gave him the name of Arashi Monjûrô. 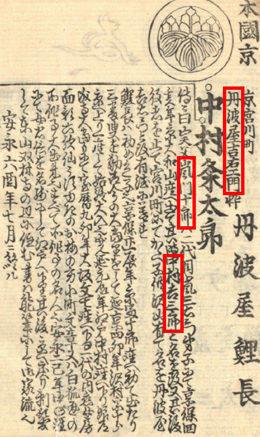 In the same book, it was also reported that he took the name of Nakamura Kichisaburô II in 1719, the year with the last record in a Kabuki hyôbanki for Nakamura Kichisaburô I. He was the father of the onnagata actor Nakamura Kumetarô I. An iroko named Nakamura Kichisaburô was active in Kyôto or Ôsaka between 1746 and 1753. Was he a disciple of Nakamura Jûzô I? An iroko named Nakamura Kichisaburô was active in Ôsaka in 1766 and 1767. Was he a disciple of Nakamura Kichiemon I? Dates of birth and death unknown. His first stage name was Tamamura Tokusaburô, when he performed in kodomo shibai in Kyôto from 1768. He became a disciple of Arashi Koroku I and took the name of Arashi Kichizaemon  in 1771. Then he was allowed to take the name of Arashi Koshichi II in the 11th lunar month of 1772 in Kyôto after the retirement of his master. He called himself Arashi Tamatoku in 1774. His fame started to rise and he had the privilege of reviving the name of Somematsu Shichisaburô as he took the name of Somematsu Shichisaburô II in Kyôto in the 11th lunar month of 1775, playing the role of Hôjô Tokiyori in the kaomise drama "Kono Hana Sakae Hachinoki", which also celebrated the shûmei of Arashi Koroku II, Matsuyama Kogenji and Nakamura Shôgorô. He went to Edo in Fall 1786 and took the name of Nakamura Kichisaburô III in the 11th lunar month of 1786 at the Moritaza, where he performed in the kaomise drama "Onna Musha Kiku no Sen'yoki". He went back to Kamigata at the end of the 1780s. He was active up to 1789. We don't know what happens to him afterwards for he disappears from the records. A minor wakaonnagata actor was active in Kyôto in miyaji shibai in the 11th lunar month of 1788. No record afterwards. A koyaku named Nakamura Kichisaburô was active in Edo in the 11th lunar month of 1798. No record afterwards. 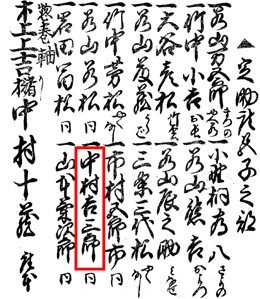 A wakaonnagata named Nakamura Kichisaburô was active in Kamigata in the 11th lunar month of 1799. No record afterwards. An actor named Nakamura Kichisaburô was recorded when he performed in miyaji shibai in Sendai at the Shakadô Shibai in 1816. No record afterwards. A minor disciple of Nakamura Kichiemon I held the name of Nakamura Kichisaburô between 1913 and 1935. Born the 21st of October 1949. He graduated from the Actors Training Center of the National Theatre (first graduation)  and made his debut on stage in April 1972 at the National Theatre, performing the role of a soldier in the drama "Ichi-no-Tani Futaba Gunki". He became a disciple of Matsumoto Kôshirô VIII and received the name of Matsumoto Kin'ya II in June 1973, playing at the National Theatre two minor roles in the drama "Itoya no Musume". He became a disciple of Nakamura Kichiemon II and received the name of Nakamura Kichisa V  in April 1978, playing at the Kabukiza the role of an akô rôshi in Noguchi Tatsuji's drama "Sadô Chûshingura". He was the first Kabuki actor to pass the nadai exam. He celebrated it by taking the name of Nakamura Kichisaburô, not as the yodaime but a new shodai, in October 1981 at the Kabukiza. He played the role of Togashi's retainer Heinai in the dance-drama "Kanjinchô" which was staged in a program celebrating the 3-generation Kôraiya shûmei (Kôraiya Sandai Shûmei) of Matsumoto Hakuô I, Matsumoto Kôshirô IX and Ichikawa Somegorô VII. He took part in Kabuki tours in North America (1990, 1996), Italia (1996) and Hong-Kong (1996). 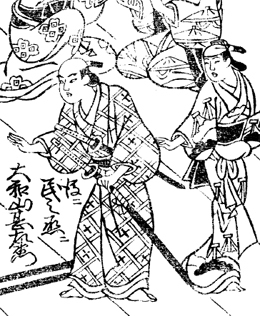 In Nojima Jusaburô's book "Kabuki Jinmei Jiten", he was recorded as being a disciple of Nakamura Shichisaburô I, who was active in Edo during the Genroku era. It was recorded that he took the name of Nakamura Kichisaburô I in Edo at the Yamamuraza in the 1st lunar month of 1699. In Nojima Jusaburô's book "Kabuki Jinmei Jiten", it was recorded that he took the name of Nakamura Kasen II in the 1st lunar month of 1711 in Ôsaka. He took the name of Nakamura Kichisaburô II in the 2nd lunar month of 1716 in the same city and he appeared on stage for the last time in Kyôto in the 1st lunar month of 1719. No record afterwards. 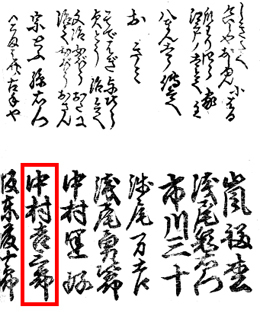 The name of Arashi Kichizaemon was not reported in Nojima Jusaburô's book "Kabuki Jinmei Jiten". Nakamura Kichisa V in the National Theatre Digital Library, Nakamura Kichisa IV in Nojima Jusaburô's book "Kabuki Jinmei Jiten" but Nakamura Kichisa (no line number) in the latest edition (2012) of "Kabuki Haiyû Meiseki Benran". The actors Nakamura Kannojô III and Matsumoto Kôjaku II also graduated at the same time.